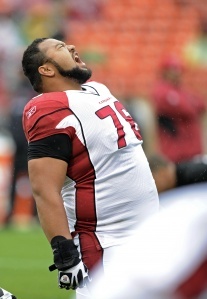 Deuce Lutui, a veteran offensive lineman who signed with the Seahawks just last week, has announced that he’s a vegan. The 29-year-old, who was 396 pounds in 2010 and was struggling with health and weight issues, decided to adopt a vegan diet after failing a physical in July 2011 with the Cincinnati Bengals. He recognized the need to make changes to his diet and lifestyle, and so when a nutritionist he was working with suggested a vegan diet, he decided to give it a try. In an interview with Seahawks.com, Lutui confirmed the rumor. “It’s true”, he said, “and coming into the offseason, this is the best shape I’ve ever been in. I credit that vegan diet.” As proof, Lutui not only pointed to his weight, he pulled up his shirt and offered, “I can finally see a six-pack there.” Lutui said he’s already at his game weight (340 pounds), a process that usually takes him much longer. Lutui seems to be a part of a growing trend for athletes to acknowledge the benefits of a vegan diet for their health and fitness. He joins other former and current vegan/vegetarian NFL players like Ricky Williams, Tony Fiammetta, and Tony Gonzalez.